The college meme groups we know and love have been infected by a disease worse than ebola, worse than the bubonic plague, worse than explosive diarrhea – sponsored content. That’s right, our very own UC Berkeley Memes for Edgy Teens and Columbia Buy Sell Memes admins have sold out their constituents for advertising deals. 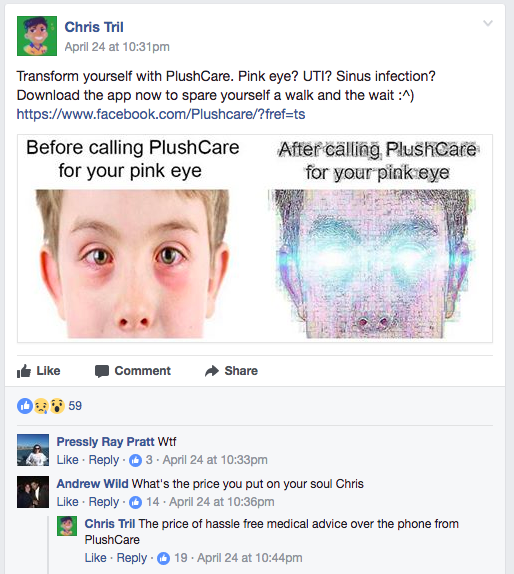 On April 24th Chris Tril of UCBMET posted an ad for “PlushCare,” which is supposedly a service that helps you heal from pink eye, UTIs, and sinus infections, according to the post. Although you may think at first that this sponsored content is good because it will reduce disease on campus, you are wrong. Pink eye, UTIs, and sinus infections are small prices to pay for wholesome meme groups. 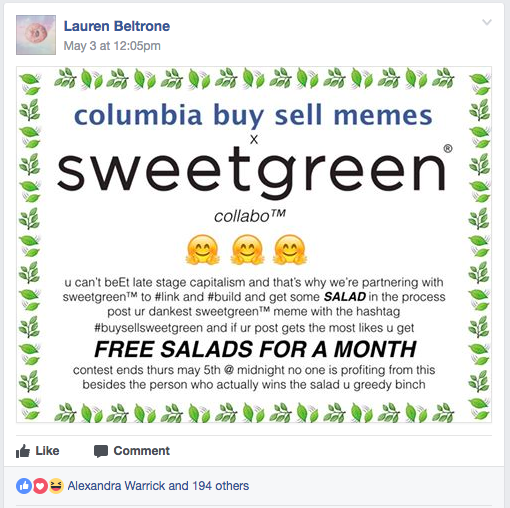 The second was Lauren Beltrone, a Columbia B/S Memes admin whose sponsor, Sweetgreen, took a classier approach. Sweetgreen is hosting a contest for the “dankest sweetgreen meme,” and will award free salads for a month to the person who posts the Sweetgreen meme with the most likes. Considering their salads range from $10 – $15, you may think it’s a pretty good deal. It’s not. Don’t sell your soul for a few fancy salads. Despite the temptations of money, we must stop the sponsored content before it infiltrates all of our meme groups and makes the actual dank memes extinct. Which group is going to be next? This is a public service announcement to all producers and consumers of memes – if you are ever offered money in exchange for posting sponsored content, alert authorities right away. 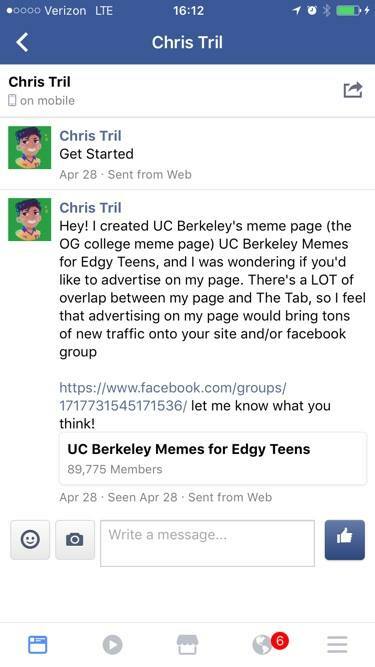 UPDATE: We should add, a little saltily, that Chris Tril of UC Berkeley Memes for Edgy Teens contacted us a couple weeks back to ask if we’d like to advertise on his page. This is is only the beginning.